Serious about conquering depression? So glad you are because a better life does await you. But… getting there involves hard work, but well worth all the effort. Here I’ll share all the information you’ll need to set you on the road to recovery. Sound too good to be true? Well, all I can say is that the tips and techniques I’ll share with you on this website, worked for me and that’s why I want to share it with you. You might feel overwhelmed and that too is understandable. Faulty thinking is the root cause of depression, anxiety, anger and even perfectionism. It took many years for your thinking to develop into what it is today, so… depression recovery will take a while, but the main factor is determination, especially a determination not to give up. 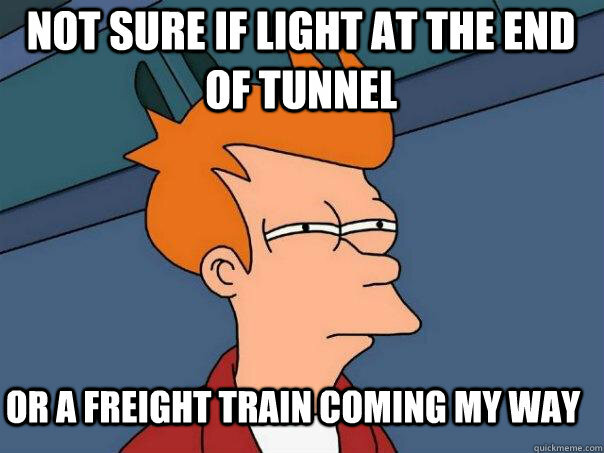 I promise you there is light at the end of the tunnel, rather than the headlights of an oncoming train! Just the fact that you are reading this shows that you are serious about conquering depression. It really is a debilitating place to exist, so well done, let me walk with you on your journey to recovery. Many people blame their depression on life events, or their upbringing, or their spouse. Does that sound familiar? The problem here is that you become a victim, depending on others for your happiness. Yes, bad things do happen to good people, but I’m sure you don’t want to live the miserable life of a victim. BE A SURVIVOR! Have a look if you recognize yourself in these depression symptoms. You can evaluate the severity of your depression by filling in this Depression Inventory. Good idea to print yourself a copy so you can keep a regular check on how you are progressing. Please don’t hesitate to ask your doctor for medication – doing so is a sign of strength, not weakness. Don’t listen to friends who tell you not to take medication – these friends are usually quite ignorant about the medical aspects of depression. Depression isn’t just a psychological problem. It is also a physical illness that needs treatment. Many people blame their depression on having a chemical imbalance. Yes, that’s true… BUT usually not the only cause. Take the medication but also learn to change the way you think. Stressful thoughts lead to the chemical imbalance and so learning to change the way you think will help sort out the chemical imbalance. 2. Understand how depression progresses into a physical illness. 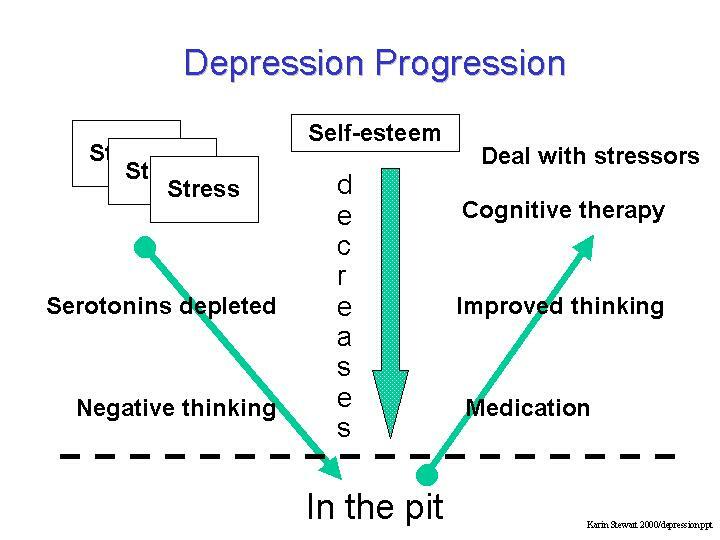 In this article I work through the below diagram to give a better understanding of many aspects related to depression such as stress, medication and why it’s important to learn to change the way you think. Remember knowledge is power. Please print out this list of faulty thinking, (pdf) of cognitive distortions. You can also view it here for a quick look, but a printed version is really essential. I cannot emphasize how valuable this list will be to you in your recovery. Have a look at the list. Can you see where your thinking is going wrong? Good. Even people who aren’t suffering from depression recognize themselves in this list. Recognizing yourself is great as it will indicate your areas of weakness in your thinking. The second page gives step by guidance for checking out where your thoughts could be going wrong, reevaluating your thoughts and replacing your thought with one better grounded in reality. Okay this might sound complicated. 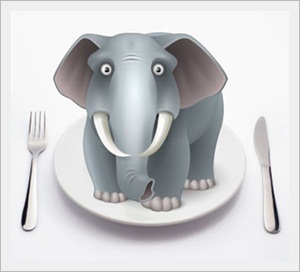 It is a big topic, but believe me, it will become clearer further along the road. 4. Mood Analysis When you reach this point you’ll have a greater understanding of depression. Now you have to put what you have learnt into practice. You need to practice listening to what is going on inside your head – listen to the thoughts that are directing your behavior. Just think about it as like driving a car. when you were learning, you had to think about each action. However after years of practice your driving becomes automatic. The same with our thoughts. They become automatic and… Well read the article…! 5. More examples on mood analysis here. It’s REALLY important to come to grips with this. 6. More Examples of faulty thinking … I can’t emphasize enough how important it is to come to be able to analyze and replace ones thoughts. 7. And finally here are some more coping skills for when you feel like giving up or procrastinating as is so often the case with depression. I have several posts that relate to depression and the easiest way of finding these is to look at Categories and click on depression or whatever takes your fancy. 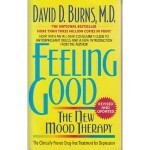 My all time favorite book for overcoming depression is Feeling Good – A New Mood Therapy by David Burns. If I had to recommend only one book on depression, this would be it – it changed my life and could do the same for you. Follow my link to Amazon for this book as well as a selection of his other books. For more of my book recommendations click here.